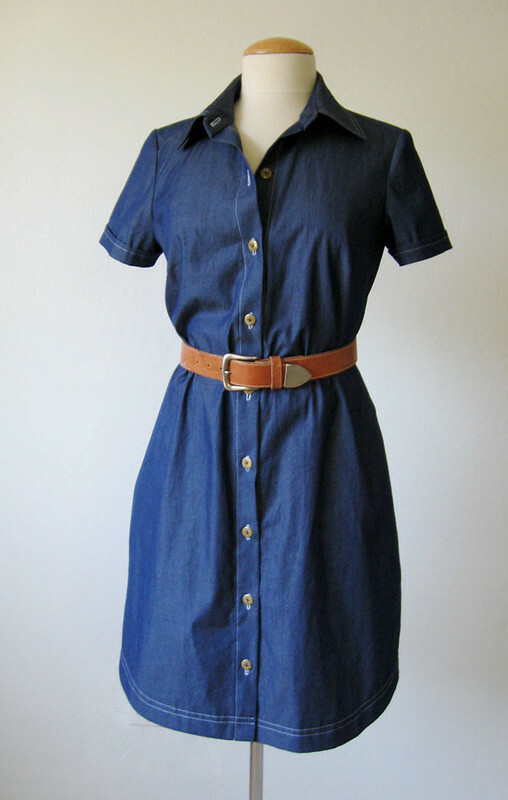 Thanks everyone for all the great comments on my denim shirtdress. Sounds like there are a lot of these in the works - and perhaps we can all wear/post on the same day. 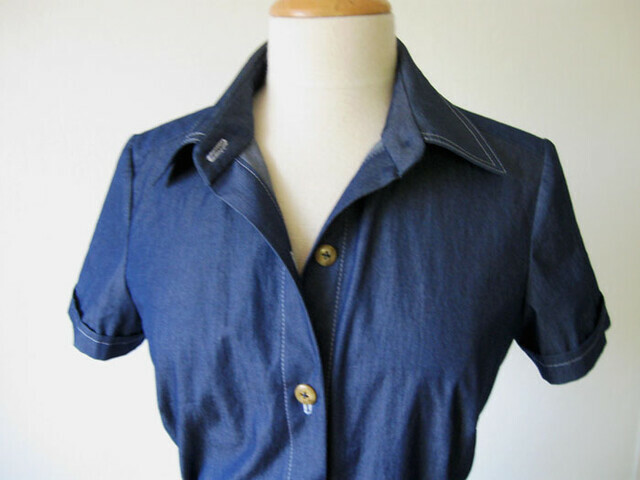 #denimshirtdressday That would be fun. Also I have had some questions on my last few items, so I will try to answer those in my next Random Threads post, maybe early next week. In other news, all the classes I will be teaching at Sips N Sews Sewing Studio in San Francisco are now listed on their website, with descriptions etc. So check it out and register! Scroll down to the section on single day workshops. I hope to see/meet some of you there. I'm working on some other technique based workshops for the following months. I'm thinking of doing a collar and lapels workshop and also welt pockets/bound buttonholes. These would be hands-on sessions where I demonstrate plus have lots of practice, students would make samples and learn how to do the techniques on any pattern. If you are in the area and are interested let me know what class topics you would like to have. Back to my latest project, using a fabric I designed on My Fabric Designs. 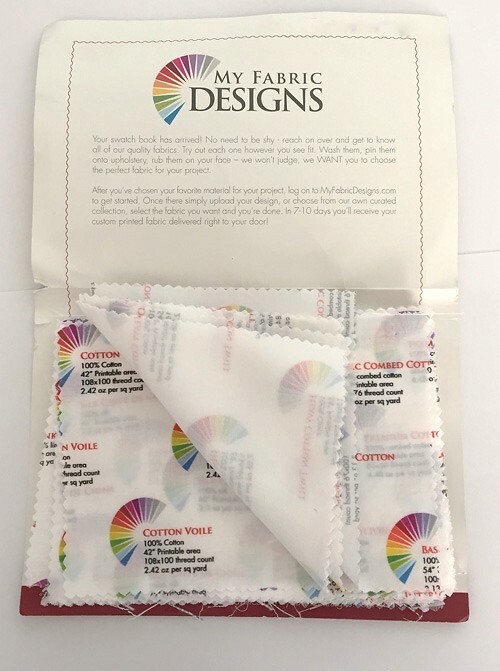 This is a company where you can upload a design or use their website tools to create a fabric design and then have it printed on any number of different textile options they offer. 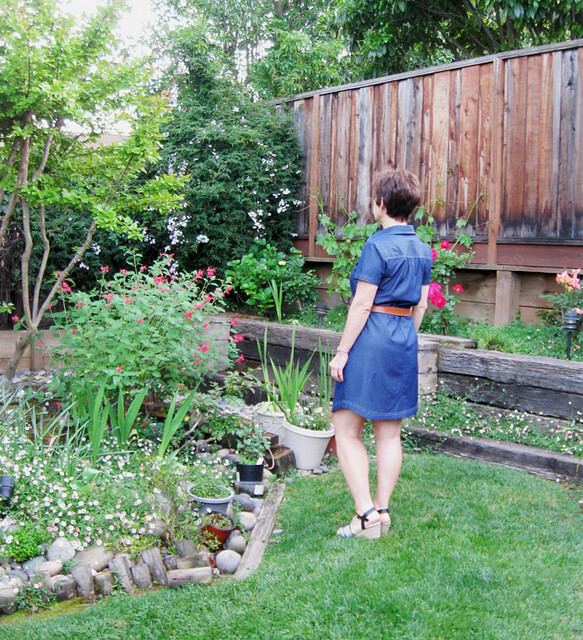 My first fabric was a cotton poplin which I sewed up into a dress, here is that blog post. For this one I decided to try their organic cotton interlock knit which is 100% cotton (no spandex). The printable width is 58" on this fabric. 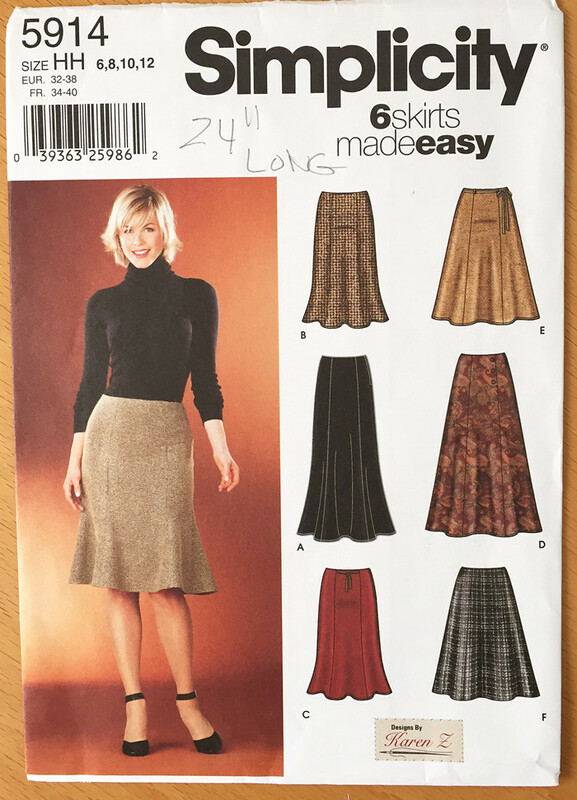 They have a few other cotton knits, including one called cotton slinky knit - that one is 94%cotton, 6% spandex, it has a 48" wide printable area and in the sample swatch book the edge is curling which indicates how the fabric might behave. If you are at all interested in doing designs I suggest you order the swatch book, it is $5.00 and the swatches are a good size (5" x 7") and also printed so you can see how the colors look on each fabric option. Once again I don't feel like I am an artist at all - so I have stayed with graphic prints that I created in Photoshop. I am much more attracted by color so I start with a color I like and go from there. I made this random dots print that seemed suitable for a cotton knit. For the top I used one of my favorite patterns, McCalls 6513 which I have used before, first here and 2nd here. On the 2nd version there is lots of fitting info (for a simple top I had to do a good amount of adjusting, but worthwhile to get a nicely fitting knit top). As they say on those late night infomercials - "But wait, there's more!" Since I had 2 yards of 58" wide fabric, I was determined to eke out a skirt from the fabric as well. It kind of gives the appearance of a wrap dress with the added bonus of a top that I can wear with other things as shown above. Score! Yes I am a fabric cutting ninja! OK maybe a slight exaggeration but I do love to squeeze a pattern or two onto the least possible fabric. Something about that just warms my miserly heart. Which means often I buy 2 or 2.5 yards of some fabric and then squeeze a pattern onto 75% of that fabric, leaving me with 1/2 yard or so of something that is really of no use. Which I save anyway...thinking that someday I will create some kind of color block item that needs just that scrap to complete it. However for this one I had shreds remaining. Which is great! Dress form pics so you can see the print a little better. 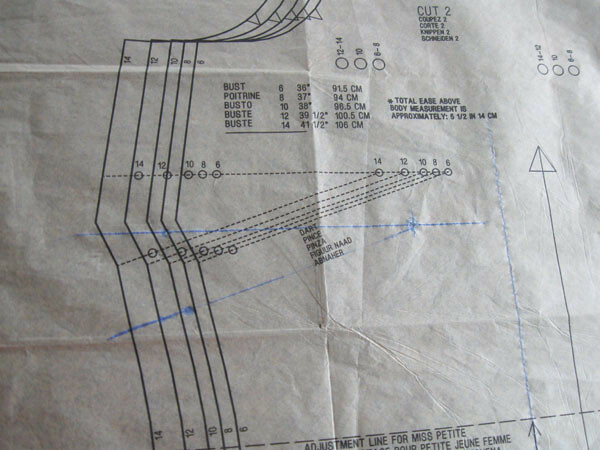 This pattern is super easy to adjust, it is a Palmer and Pletsch pattern so it has all the adjustments built onto the pattern pieces, very good for learning how to do a lot of different adjustments. And princess seams so you can shape as you sew. For the skirt I kind of winged it. The pattern is one that has been in my file for ages - I always have it in the back of my mind for just this type of thing and finally I used it. Although I did a lot of fitting after I cut it out. I think I did a size 12, with adding 1 inch on the side seams for fit insurance. and then shortened from the waist as it was way too long for the look I wanted. Then the whole thing was kind of big so I tapered all the princess seams down about 12 inches - so it would keep the flare below the hip. 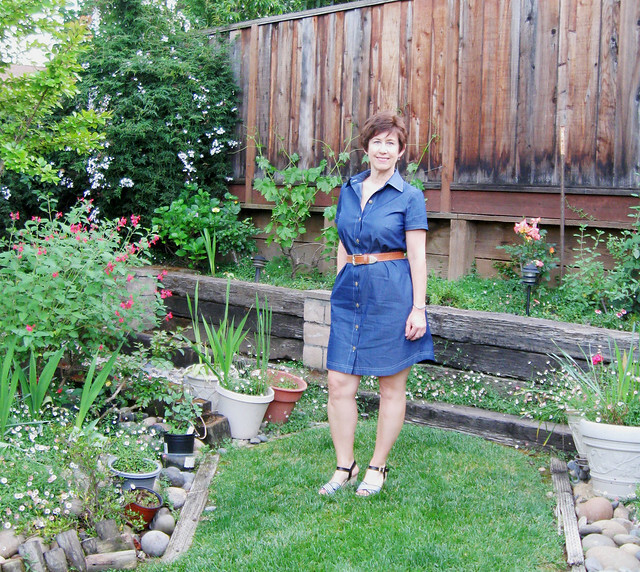 Super easy skirt to make and a great bottom half for a faux-wrap dress. The pattern is a bit misleading, I made the Version B but it is not at all as tulip-y at the hem as it appears on the pattern picture. Perhaps in a more structured fabric it would be. I think my finished skirt is about 21" long. So that's the latest on my fabric designing efforts. I just created another one and this time ordered the silk crepe de chine so I am looking forward to making a floaty summer top with that. Disclosure: My Fabric designs have provided me with an allowance to create fabric each month. Thus far I have been really impressed with the quality of the fabric, although I find designing a bit of a challenge. 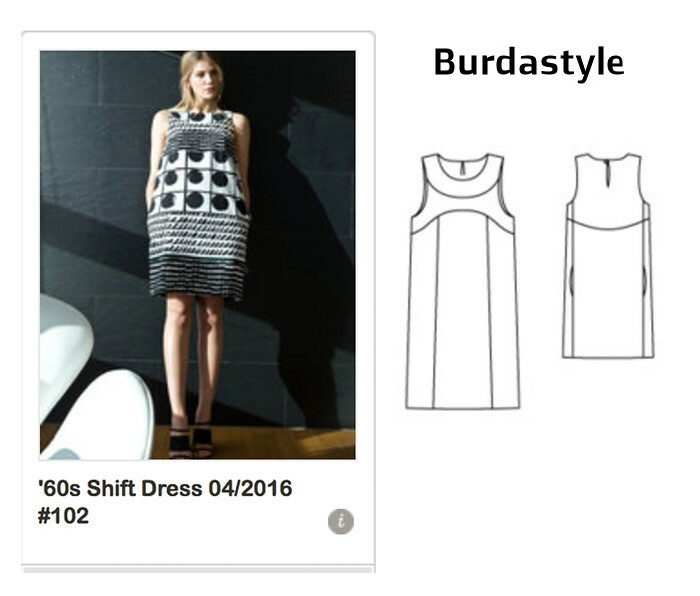 Up next, another new silhouette for me (that recent BurdaStyle pattern release Mod Style really grabbed me). And some prep work for my classes in May. Do you ever see a new pattern and have to have it? I mean like, a duplicate of the pattern envelope version? Sometimes that happens to me and I'll bet I am not the only one. 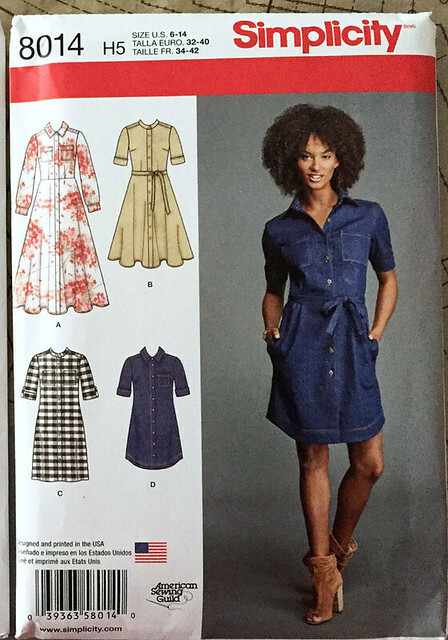 So when I saw Simplicity 8014 with the denim shirtdress pictured there I wanted to make it immediately. I will say that my version is less successful than theirs - partly due to my choices and partly due to the fact that I am not a tall and slim model with fabulous hair. 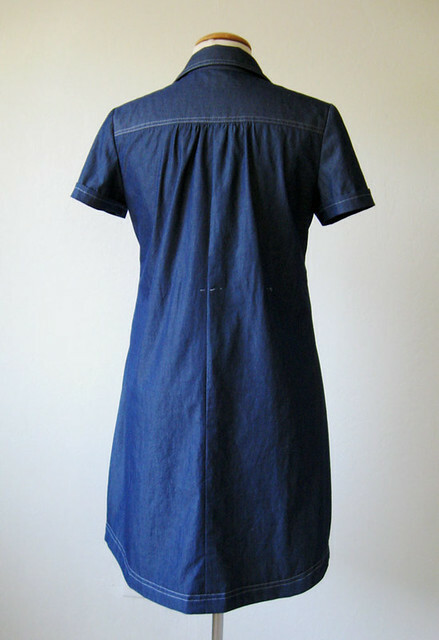 But I have created a very wearable and sharp looking denim shirtdress that I think will be great for spring/summer/fall wearing. Returning to the title of this post - in other news: I will be teaching some sewing classes at Sips N Sews Sewing Studio in San Francisco starting in May. I know they are currently working on their website and calendar entries so everything is not listed yet, I will post here when all the info is listed. Sips N Sews is a subscription based sewing studio - I went there in September for a Bay Area Sewists Meetup and I was so amazed by the space. It is a typical San Francisco storefront entrance, but past the doorway lies a huge workroom with every kind of sewing machine, cutting tables, a classroom space and even sewing supplies to use. Classes are open to both their membership and non-members. 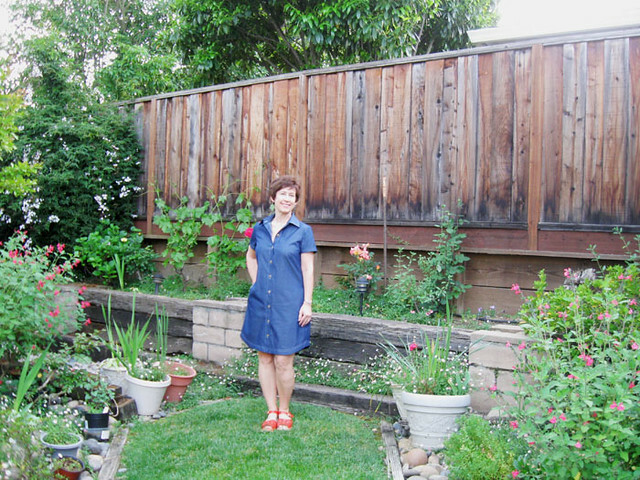 On Sunday May 22, I will be teaching a day long seminar titled: Sew a Summer Shift Dress. (Say that 3 times fast, ha) Anyway - stay tuned for more info and email me directly if you want more details. OK - back to denim. Remember a couple of posts ago I said "when in doubt sew denim." Maybe that doesn't apply to everyone but it certainly applies to me. I always have a good feeling about things sewn from denim. Perhaps because I am a child of the 60's - 70's when denim began its utter dominance of all things fashion - or perhaps it is my native San Francisco roots where Levi's were born - but I think denim can be sewn into anything from casual playwear to tailored garments to a formal gown. (some of you might disagree on that one). I had a piece of denim that was a remainder from another project, so not really ideal for a dress but in Project Runway fashion I made it work. It looks a bit rumply here - but I don't notice that in real life. Some things just look better in person than in photographs. Sadly for me I think it looks better on the dress form than when I am wearing it. Although here it photographed in the absolutely unwrinkled state - unnatural really. After all we look at magazines and catalogs and want to appear as the people do there - which is impossible since they are pinned, tucked and Photoshopped into smooth and unwrinkled perfection. Back to sewing details. As I mentioned, the fabric piece was a remnant and barely enough to eke out a dress. So no to the chest pockets, short sleeves and sadly, no to the self-fabric belt. Which is a bit of a shame as I think it would have looked better. Although I did rummage around my belt rack and came up with this one which I have had for maybe 25 years? And this belt has a little purse that has small hooks which clip into some eyelets in the belt, so kind of an upscale fanny-pack item. And which I have rarely used. Although now in the "carry our phone everywhere" era it might be time to put that accessory back into use. This is the piece of fabric. 60" wide but only about a yard of real yardage where the tape measure is plus some more. This is really lightweight denim - more like a chambray weight but the color is a deep blue. Pattern envelope. I love the shirt tail hem on the dress. What I do not love is the back. Which in this version that I sewed has a gathered center at the back yoke and then no shaping. Also without a belt I think it looks ridiculous. Or else I am just not used to things that don't have a waist. Do you watch Call the Midwife? I like most any of the PBS/BBC shows that are set in another era - partly because the costuming is so interesting. So this dress reminds me of something they would wear as a very utilitarian work dress. Just need the red cardigan and the hat. (and a lower hemline). A couple of fitting adjustments. The aforementioned back length adjustment. Also I lowered the bust dart by an inch. Note this is a bit of a trap for new stitchers. 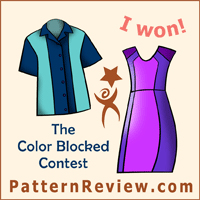 This pattern, and many shirt patterns have a dropped front shoulder seam. 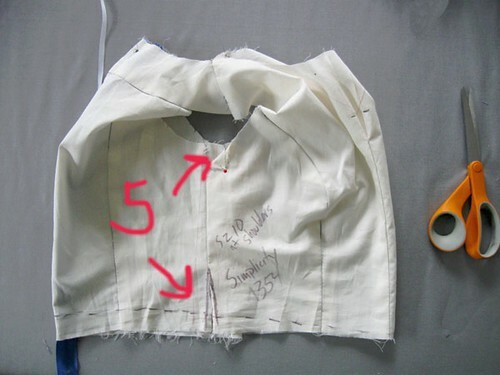 So you have to pin the back body and yoke together, then pin at the shoulder seam and drape it over your body to accurately see where the bust dart lands. 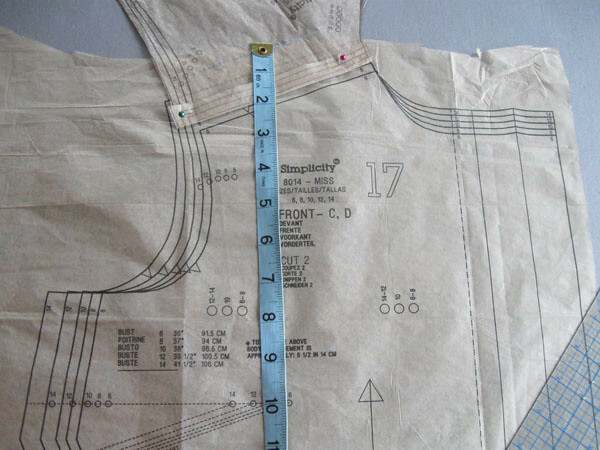 Note that the measuring tape is starting at the actual top of the shoulder, not at the seam which is lower in front than the shoulder point. This is a pretty easy adjustment, I just traced the dart shape on tracing paper, and then moved it down. Alternatively you could cut out the dart and move it also. Back view on form, see how much gathering there is in the center back. And a few stray white threads marking the waist, where I was contemplating putting a channel elastic, although I tossed that idea. I have finally gotten the buttonhole attachment on my newish Singer machine to work properly. Although I will never like it as much as the old vintage version. Which I use sparingly now as it is on its last legs due to dropping it and also cobbling together some parts. I found these buttons in my button box - which is a old cookie tin holding all the buttons that people have given me. Filled with mostly useless but a surprising number of good choices. My last challenge with this dress and the reason I remembered that this fabric was not previously used for something is that it might have been at the end of a bolt and I bought the whole piece which was available. But didn't use this portion as it had a whole lot of writing on the inside, done with some type of indelible gold marker pen, see below. I have rolled it up so you can see the inside of the fabric but also that it showed through to the right side of the fabric in some places. eek! So with some extremely judicious cutting I was able to avoid it almost everywhere but I had to use that portion of the fabric. 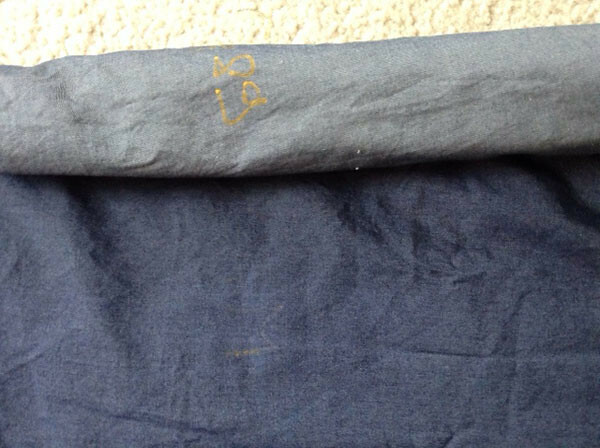 So the collar stand, both inside and out were cut from the portion of the fabric with that gold writing on it. That seemed the most inconspicuous place to put it and I am sure no one will ever notice. For the inside yoke I used some black cotton batiste. Well that is all for this dress, despite my criticisms and the fabric challenge I think it is an OK result. A dress like this needs accessories, so when I wear it I will dig around for an interesting bag and perhaps some colorful shoes. Up next, more sewing with fabric from My Fabric Designs, and another new silhouette. 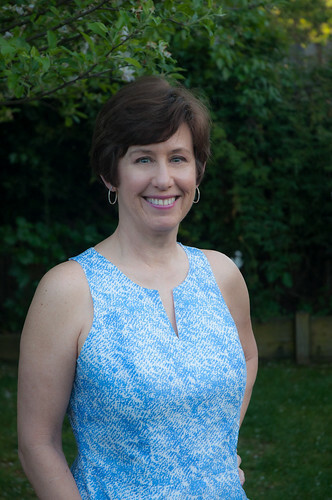 Thanks for all the nice comments on my last post - for that Burda top. It is appealing to me more and I am wearing it today :) with red jeans. Gardenwise this is the month to enjoy - lots of colorful blooms and not much work. Plus tomatoes planted! Hurry up home grown tomatoes. ( no hurrying, they will be here starting in late July no matter how much we wish them to be ripe). 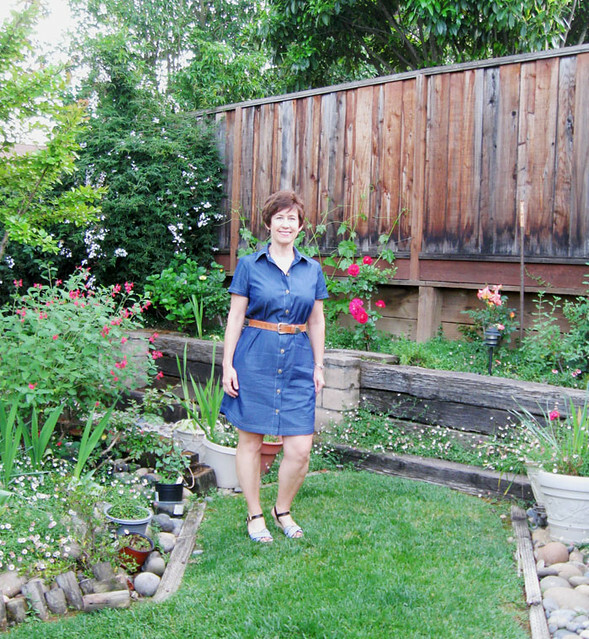 Happy Sewing and if you are in the SF bay area I hope to see you at a sewing class. 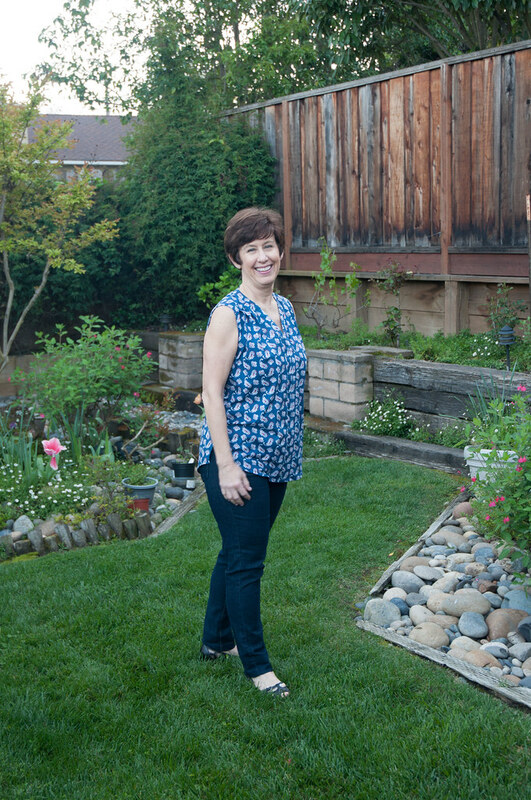 For today's garden photo - how about that luscious rose that is visible behind my left shoulder? I think it is called Cherry Parfait - but not 100% on that. Anyway it is such a great color. and the shade of my latest sewing project! Do you ever feel like you ought to sew something different? Like a different silhouette? Or maybe a color that currently doesn't have a place in your repertoire? I do. I've been thinking about this question lately and come to the conclusion that I want to try some different tops. Reflecting on what I make for myself, I think I have a good variety of shapes in coats, jackets and dresses but I don't really branch out when it comes to tops. 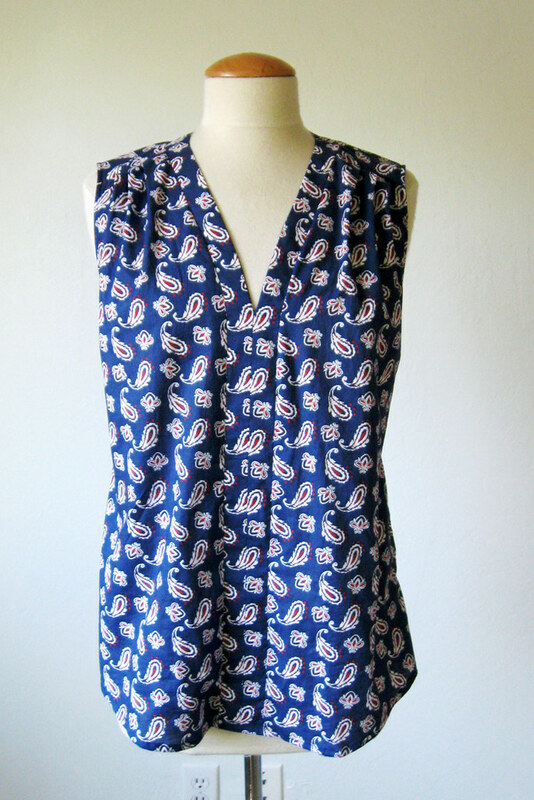 And I see so many cute and interesting tops that other people are sewing. Consequently I bought Burda 6632 and sewed it up using a cotton which I bought last December at Stone Mountain. 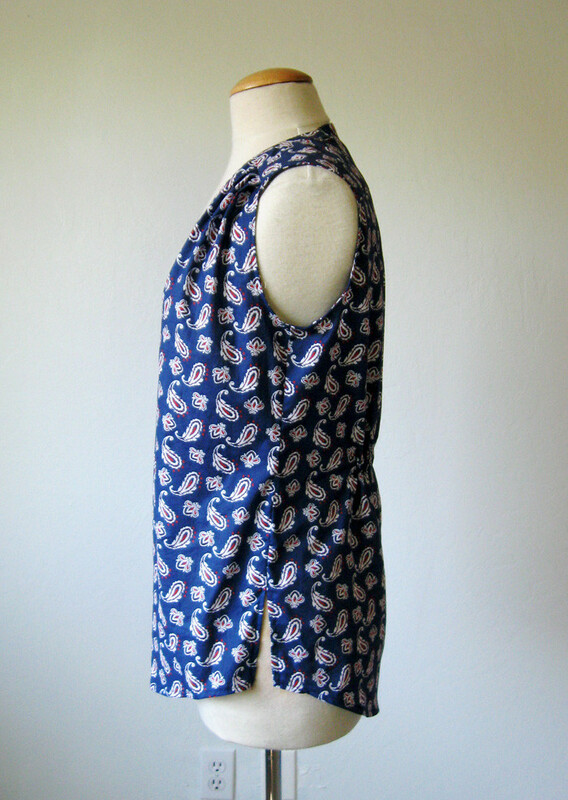 I originally bought it to sew a Christmas gift and there was about a yard remaining after making that project which was just enough for this sleeveless tunic. And that is another question, what defines a tunic top? To me it is a bit loose, most often collarless, and maybe longer than a button front shirt. I'm not sure I landed on tunic top with this one but I did end up with a nice floaty top which will be very wearable in July or August. It has forward shoulder seams and some pleating there, and then the neckline band meets in the center and continues down to the front hem. The inside of the band is pieced as I was down to little scraps of fabric when I cut it out. Sewing this type of fabric is so nice - cotton lawn and voile just sew up like a dream and press so easily. Here is the back view. It has a yoke and then the back is very full and gathered into the center of the yoke. It looked very balloon-y on me (at least I thought so). 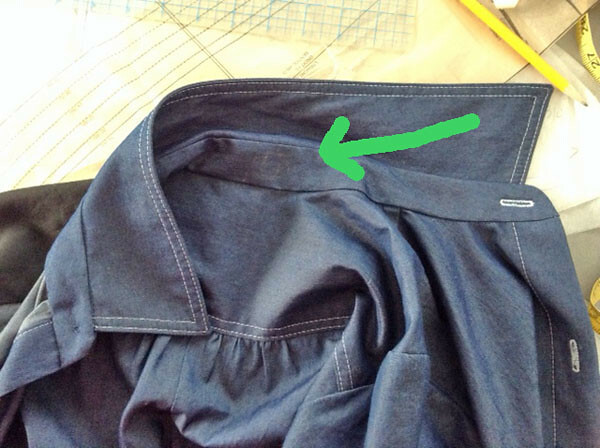 So I added the little bit of elastic in a channel at the center back waist. Not on the pattern but my little fix to take in some of the ballooning. I think if I were to make it again I might take out most or all of the gathers at the center back and just have it be flat at the yoke. There would still be enough room in the back. In a silk it might be fine, more floaty and drape and look better, sometimes you just have to adapt a pattern for the fabric at hand. Side view on the dress form. I like the shape of the hem and that it is a little bit longer in the back. I just made self-fabric bias binding for the armholes - which the pattern probably noted but I didn't look at that part. Although I did have to read through the instructions for the center neck band piece. Here's the pattern envelope. And by the way, I lopped off a bit from the outside edge of the shoulder. 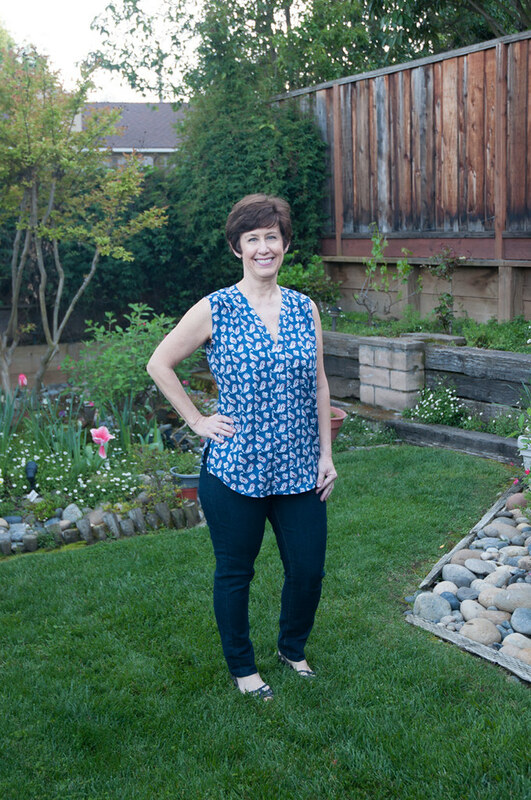 My standard adjustment - I can't stand sleeveless tops that are too wide in that area. Looking at the photos above I would have liked to take away more but I think the pleats were in the way. 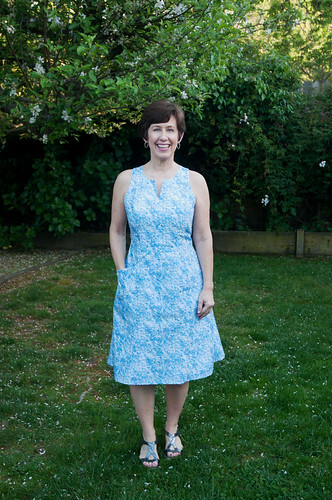 I sewed the size 38 but now I'm thinking that in roomy Burda styles I might even try the 36 next time. So now I have tried another silhouette. And hmmmm. Not so sure I like it. But whatever. Worth a try. However I just finished a different item, with another new to me silhouette, and I love it! Which goes to show, you never know until you try something out. We took these photos about 3 weeks ago - it was almost sleeveless weather that evening. And then more rain - yippee - and now I think spring is well and truly arrived. I have tomato plants growing happily on the patio! I have more fabric from My Fabric Designs that I am about to cut into very soon - after pondering what to make with it the light bulb went on. Are you one of those people who puts their head on the pillow at night and then reviews your day? A quick mental scan of what you are doing tomorrow? and any puzzles that are rattling around in your cranium? Oh, is that just me? Yes, some nights I fall asleep in a snap but most times I have the sense that just before I go to sleep I open one little mental filing drawer, pull out a question and think about it a few minutes. It could be anything from where to put a new plant, a solution to a family dilemma, what to cook for a dinner party, how to advise a friend with a sticky situation, or the most relaxing one of all - what to do with a particular piece of fabric. OK, fabric usage is not the most earth-shattering issue but enjoyable to think about nonetheless. Next up - the result of my recent declaration which was "when in doubt sew denim". 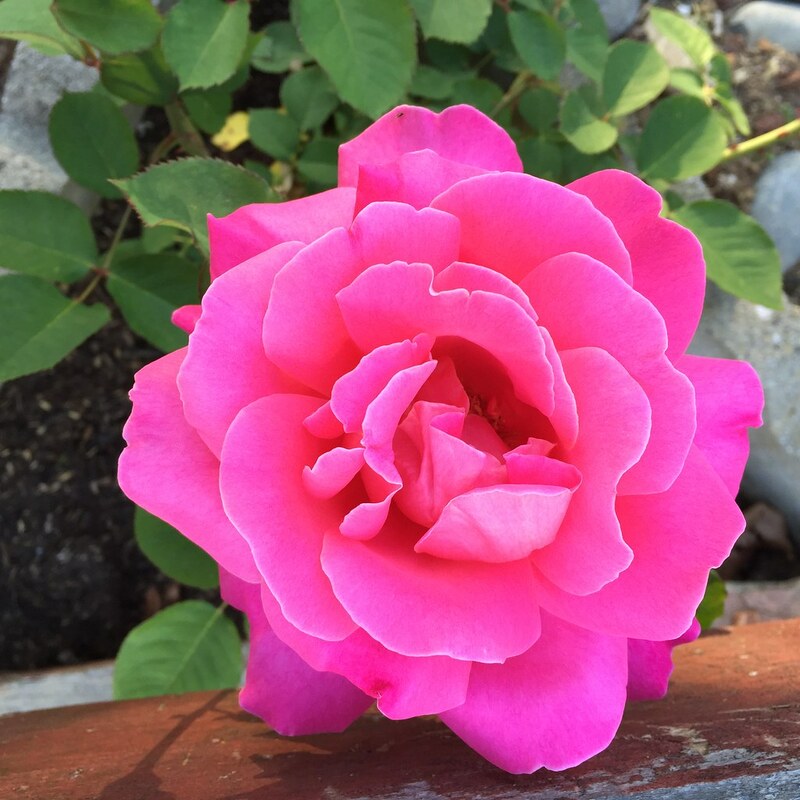 The roses are blooming everywhere, my neighborhood is awash with color on every street. Lovely! 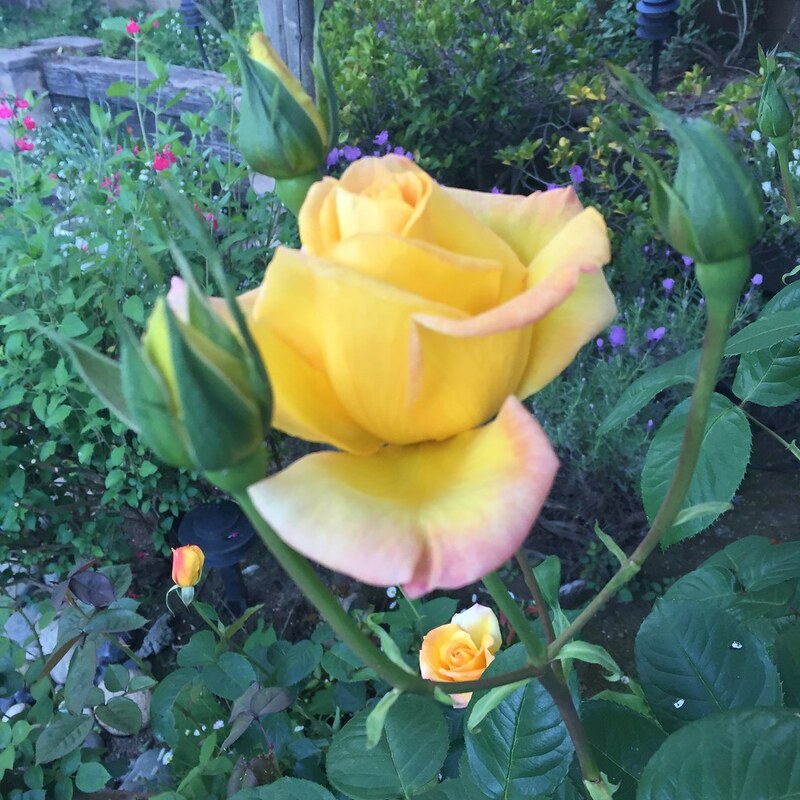 This yellow one in the backyard is usually a first to bloom then kind of drags staring in July. But so nice for now. Which might seem mysterious but will make some more sense once you read a bit further. As mentioned in my previous post, I had the opportunity to use My Fabric Designs to create a custom printed fabric. Once it arrived I decided it should be a summer dress and had just the pattern in mind. Due to the lighting and my photo skills the details might be hard to see but you get the idea. 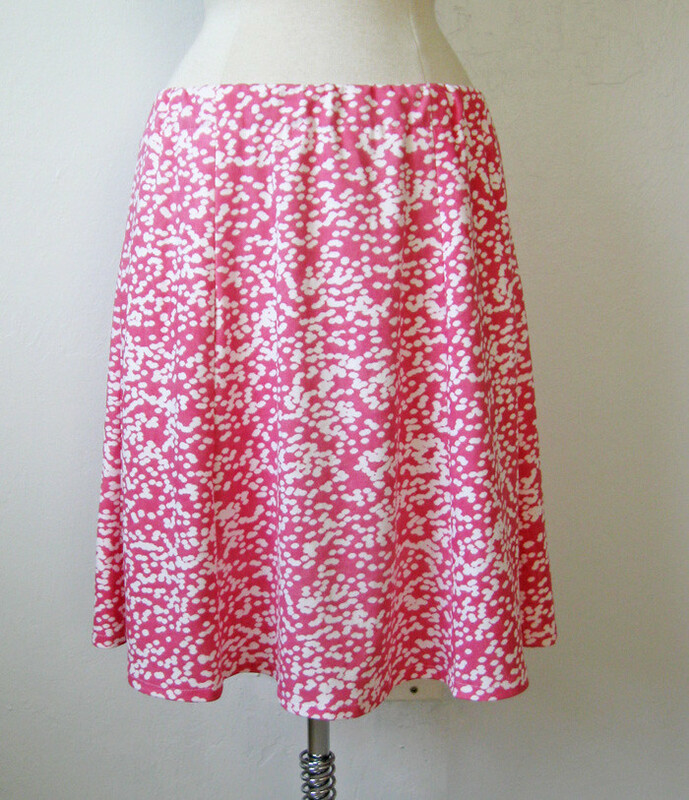 The skirt has a center panel and then side panels with slant pockets. The bodice has princess seams and slightly cut in armholes with a rounded piece at the back neckline. Here is the previous post with the first photos on this dress. I used both these patterns to create the dress, Simplicity 1354 for the bodice and Simplicity 2174 for the skirt. 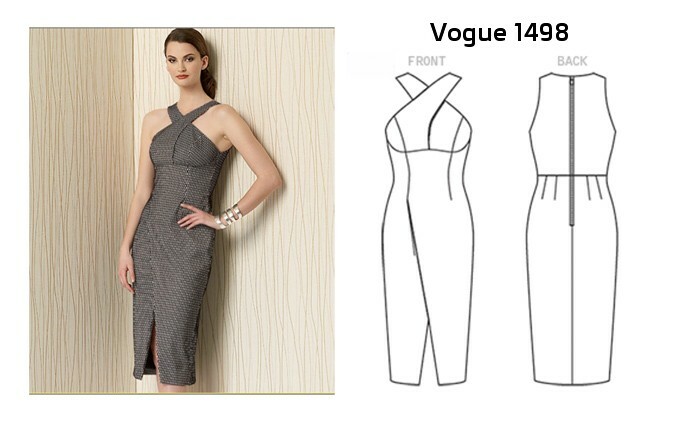 But what I really wanted to use was this Vogue 2900 DKNY pattern that I have been saving for just the right moment. I first saw it sewn up by Yoshimi and then she sewed it again here. But I didn't seem to get around to making it. Then Carolyn got in on the DKNY goodness and also sewed it up. And I wanted it even more. So told myself that this was the year I would make it. 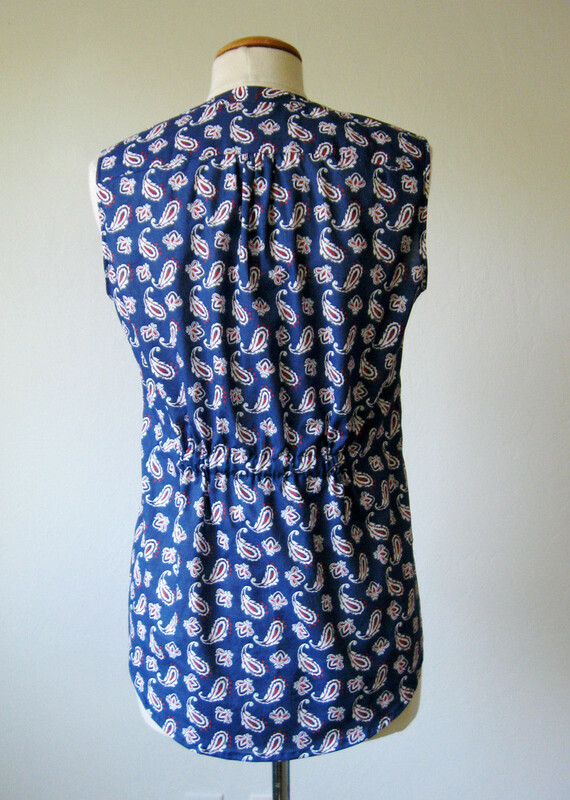 Consequently when I evaluated this self-designed cotton poplin I though "oh, self, make the Yoshimi dress" and went rummaging in my Vogue patterns. Where I didn't find it. And realized that the pattern I had in the drawer was actually this one. 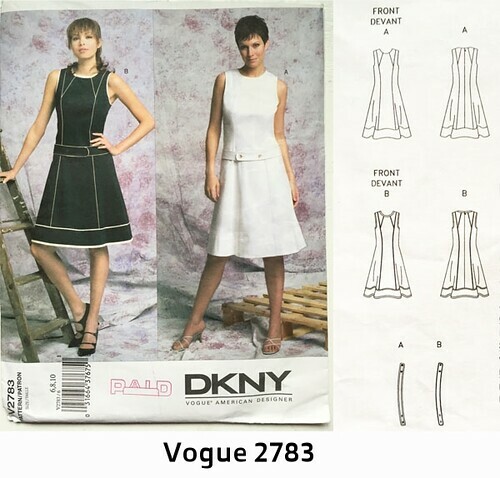 A perfectly good pattern, and also a DKNY who is my favorite of all the Vogue designer patterns but not the one I wanted. I briefly thought about buying a copy of the V2900 on eBay but economy won out. 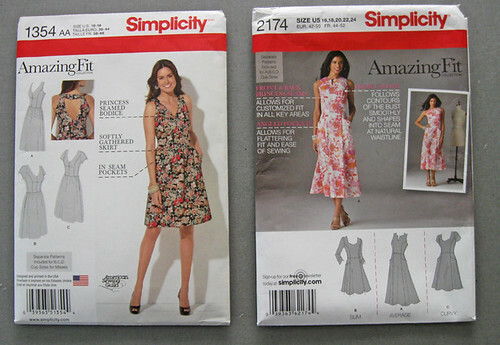 Back to rummaging among the pattern and I found that Simplicity 2174 which is quite similar to the shape/style that I wanted, but my copy is a size 16 - 24 and I usually start with a size 12. So that would be quite a chore. However - another Simplicity Amazing Fit in the box caught my eye, and that is why the result is a frankenpattern re-creation of the Vogue that I wanted. Now for the fitting details. 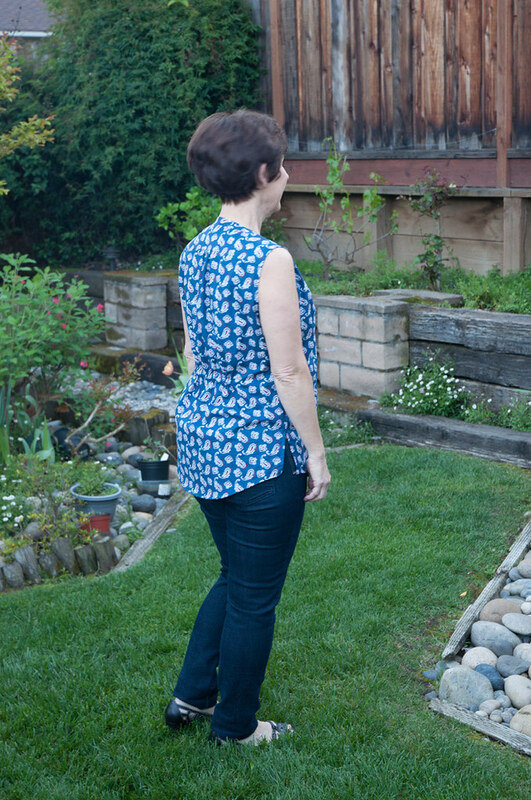 This Simplicity 1354 was size 6-14 with cup sizes so I looked at the finished garment measurements and started with the size 10. I have always started with a size 12 but on most all pattern brands I have to take in the front neckline and even the center back neckline, so I wanted to test out starting with a 10 C and see what happens. And this might be my new size, at least for dress bodices. I made a muslin of just the bodice, as the skirt could be fitted with larger seams as fit insurance. I always stitch in a zipper. This is my trusty blue zipper which I use and remove from so many muslin bodices. With the ribbon tied on the zipper pull like on a scuba wetsuit so I can fit it on myself. Starting with the back of the bodice. 1. teeny adjustment at the back shoulder, there was a bit of excess fabric where the back met the neckline, so I just pulled it in about a quarter inch at the edge tapering to nothing. 2. 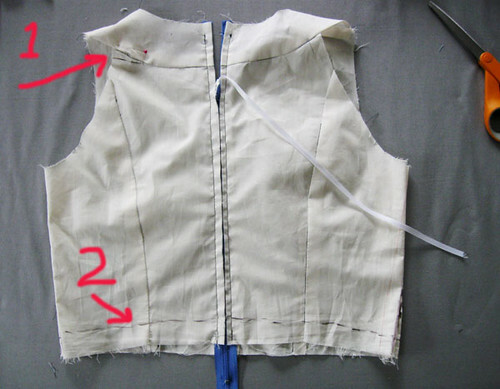 Shorten the back of the bodice. Everyone calls this a swayback adjustment but I will stick with shortening of the back bodice. There is too much length there and the back waist seam is too low. I mark where I want the stitching line to be using a sharpie pen (tie a piece of elastic round your waist to decide where). Considering that the muslin includes the waist seam allowance I probably shortened it about 1/2 inch. 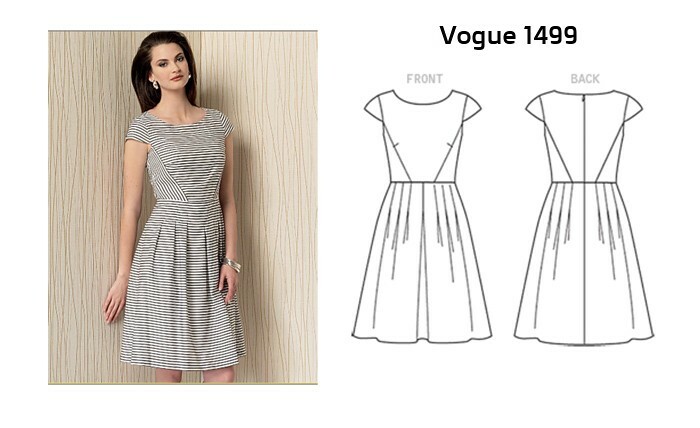 You can see on the original Simplicity 1354 pattern it has a V-neckline which is pretty but not what I wanted here. So I drew in a rounded neckline but kept the markings for the V-neckline so when I tried it on I could check both. I can see doing the V-neckline version in the future so figured it would be nice to get it fitted now. 3. I liked where the rounded neckline landed on me as it was on the muslin, so if I want that to be the edge then needed to add some seam allowances. 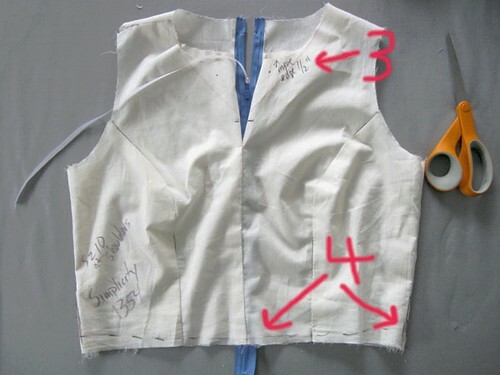 My scribble here says to add 1/2" to the center neckline edge and taper to nothing at the shoulder seams. Note I have also marked where the center front vertical opening will end. I also decided that the narrow V opening in the center should be about 1 inch wide. 4. Waist seam - based on my try-on I had determined that the back waist seam needed to move up but the front waist seam needs to move down a bit. Since I had started with a size 10 I expected this plus often more length is needed in the front. So adding about 3/8 inch at the center front. All this is a bit inexact as I just add plenty of extra seam allowance and figure I will get it precisely lined up in the real fabric. 5. Side seam. I can't recall exactly but I think I added 3/8 inch on the side seams when cutting out for a total of 1 inch seam allowance. I like to adjust in the real fabric on the body as every fabric and sewing pattern behaves differently. 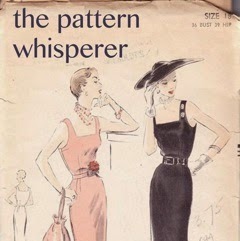 I think a lot of stitchers are searching for that perfectly adjusted pattern which is an elusive goal - what I want is a perfectly fitted garment and the pattern takes me part of the way there. Now I cut out all the pieces for the bodice and then moved my attention to the skirt portion. I used the size 16 version for the skirt - which would be a bit big but I was the smallest in the envelope and then figured I could adjust it as I sewed. The one thing I gave up on with this pattern is to match the princess seams in the bodice with the ones in the skirt. With this busy print they don't show anyway and frankenpatterning a size 10 from one pattern with a 16 from another was more work than I wanted to put in. Here is the part where some of you might say aaaargh.....too much work? Basting is my friend! I machine baste everything together, and try it on. Including basting in the zipper. It really is a simple matter to try on and then just adjust a tiny bit here or there. Those large seam allowances make it really easy. I use smallish silk pins to pin seams in the spots where I want to try them out, and then just rip out small sections of basting, re-pin and try on again. That includes tweaking the waist seam up or down as needed. With a good helping of pencil marks or those heat-removable ink pens. You can see my extra large side seams under the arm and then the side seams on the skirt which behaved a bit strangely, front one smaller than back one but you can get a feel for how the fabric should hang in the skirt portion. Then once I have it all basted or pinned to fit, I go over any newly adjusted parts with faint pencil or chalk mark and then sew it all up for real. Including the zipper. 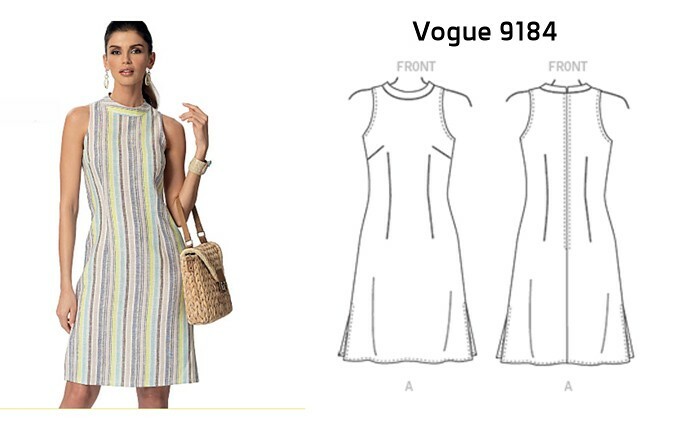 The back neckline of this dress is just my style, and I think I will try out the pattern envelope version with the cutout out and front V-neckline. Here is the final fit on me. I think it is just about right for a woven cotton dress (meaning something with no stretch. Keep this in mind for the next picture. Demonstrating my philosophy that there should be some ease in woven garments, I like them to float instead of be absolutely fitted. Less wrinkling and pulling on the body, more comfortable. There is about 2 inches in circumference more than my waist. Too much? I think when you are moving, sitting down, in action then it is just right and doesn't look too big at all. Interested to hear thoughts on this one. I can't leave off with that photo so here is a repeat from the last blog post. 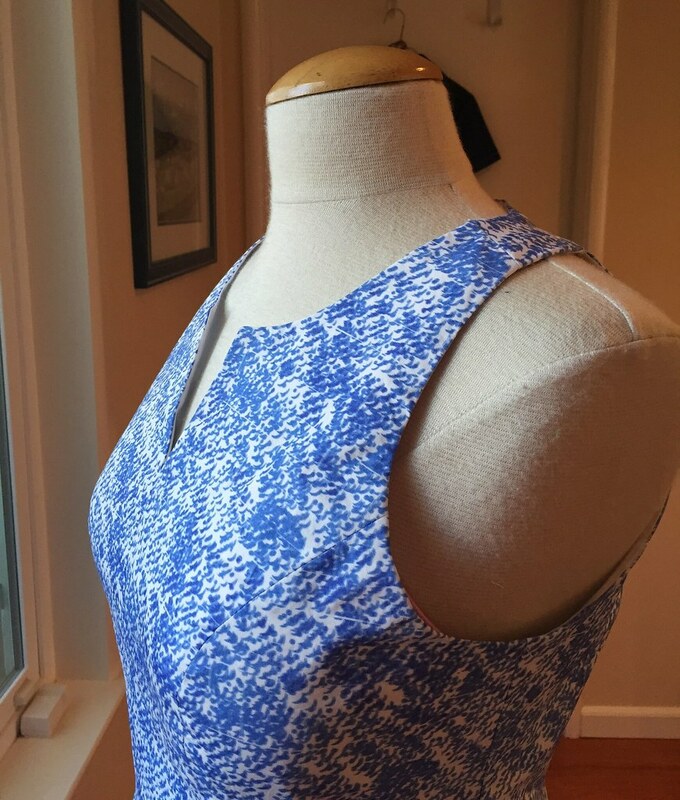 I'm happy with the neckline/shoulders fit - will definitely repeat this pattern. And will try to stand up straight - looking at sewing photos is a wake up call about posture, isn't it? That's all for this one. I have been on a sewing streak lately so lots of things for the blog in the near future. We had a really rainy weekend so no photos completed but this week I will try to get some accomplished. 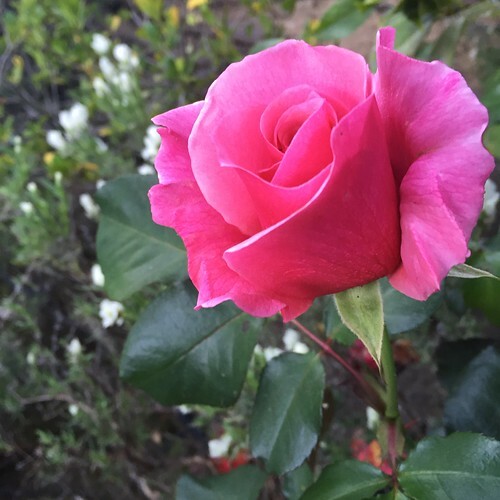 April showers were so welcome - the roses are loving it. 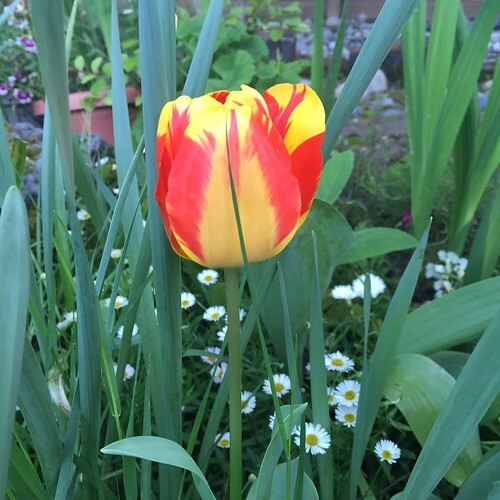 these tulips have been popping up and I completely forgot that I planted them, I thought it was a bag of yellow and red ones but apparently they are the variegated version. So nice! Have you wanted to design your own fabric? I have always thought it would be fun and a great way to get all the colors I want (which might just be too many for a lot of people). Recently I was contacted by My Fabric Designs and offered the opportunity to try out their fabric. Why not jump to the end of the story? I am impressed. They have a lot of different fabric choices including cotton voile, cotton sateen and poplin, a cotton silk blend (which is luscious and I want to try soon). Also silk crepe de chine, a variety of knits, polyester woven and knit, some fabrics suitable for athletic wear and also for home dec or quilting. So quite a variety. Since I am only interested in making clothes - for the most part - I decided to try the cotton poplin and start with one color on a white background. I am so far from being artistic in terms of painting, drawing or anything like that, consequently I created something in Photoshop and then did some research on repeating patterns. The My Fabric Designs website has a tool to upload or create patterns and then further tools that tile or place the graphic in different ways. For this first one I used some basic edits to have a repeating pattern without obvious seams where the print repeats. I also figured using a small and busy print would disguise that issue. Once I saw the finished fabric it actually showed me more about how it works so I will apply that for another one. The fabric quality is really nice. The cotton poplin has a printed area of 42 inches wide so I ordered 3 yards. I figured I would make a dress or a shirt but when it arrived I decided on summer dress. In my next post I will give some more details on this dress as it is a mashup of two Simplicity Amazing fit patterns and I think fairly successful. Also I washed it in the machine, on warm temp just like any other fabric and then put it in the dryer as I would cotton (on the high heat temp). It came out perfectly, the color seemed exactly the same as before washing, and then pressed very nicely. If you are at all interested in trying this out I suggest you order the swatch book which is sold on their website, it is $ 5.00 and well worth it to see the various fabrics and also how the colors print on the different fibers. The printable yardage on the various fabrics ranges from 42 inches wide to 62 inches wide so you really have to look carefully when ordering so that you have enough fabric for your project. The prices range from around $ 17 per yard for the cotton to around $ 38 per yard for the silk so quite a spread. I'm sure this fabric looks different in every photo which depends on the light and time of day and my not so great photography skills. My pal Alice took some pics of me wearing the dress, so here you go. 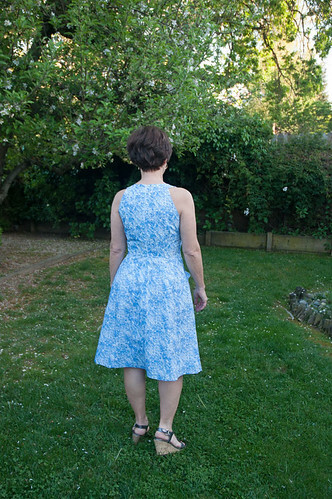 This was in the early evening shade under the apple tree so the blue in the dress looks quite a bit different. 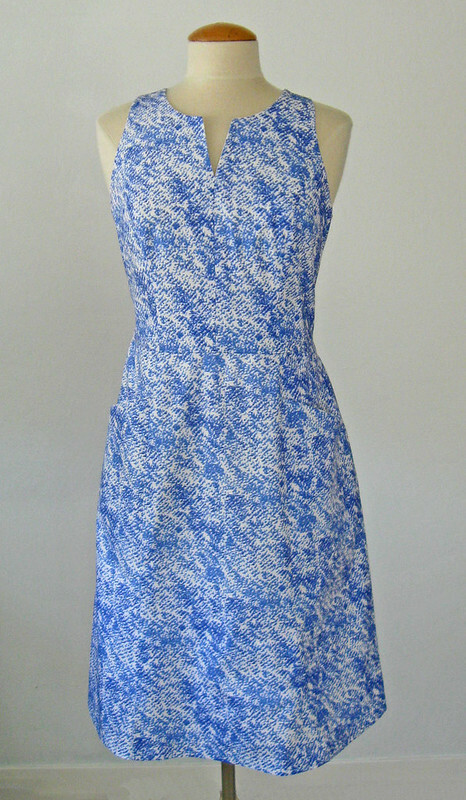 All in all I am really happy with this summery cotton dress and since it is about 90˚F here today it will get worn very soon! 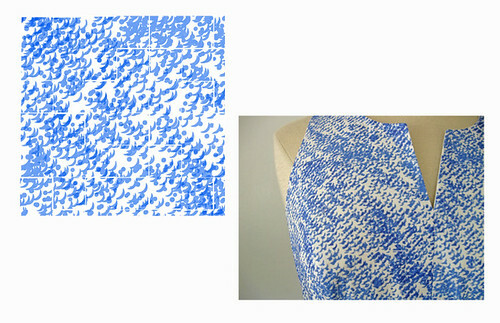 Here is a better look at the fabric, close up on the dress form and juxtaposed with the actual image that I uploaded. They have a lot of choices on the website, most of them seemed like quilting cottons at first glance but I suppose a lot of them can work for different garments, children's clothes or especially home dec like pillows or other home items. I think the option to create a fabric to recover dining room chairs or something like that would be fantastic if you had a specific pattern and color family that you wanted. Also that is a shower of pink and white petals on the ground, from the apple tree blossoming away behind me. Too bad they are not very nice apples, but someone told me yesterday that I should offer them to people in the area with horses and there are plenty of those nearby. So I will remember that when September comes. 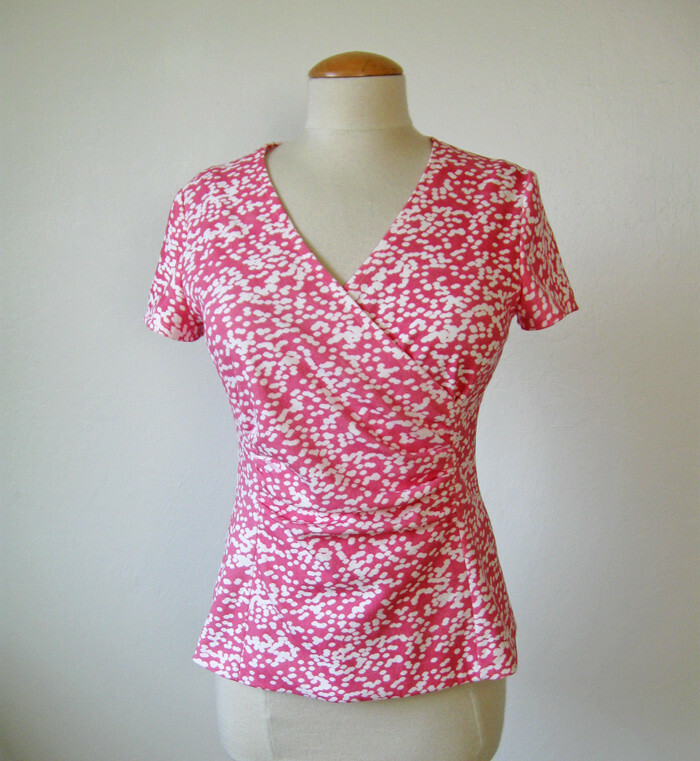 I have ordered two other fabrics from My Fabric Designs, one is a cotton interlock knit and the other a cotton sateen. The knit is a really nice quality so that will make up a dress and the sateen is a bit more lightweight than I expected, more like a voile. I think it will make a pretty top. You can also upload your designs and then order a fat quarter or a 5" x 7" swatch which seems like a good investment in order to see if you like the way it prints and the texture/weight of the fabric you choose. Note: I received this fabric as an allowance from My Fabric Designs and was able to select the fabric and design of my choice, and sew whatever I chose from that fabric. Next up more details on this particular dress, such as what pattern(s) I used, what Vogue pattern I wanted to use but was too cheap to buy since I have sooooo many patterns already, and how I fit as I sewed to good effect, and now have another bodice pattern which I can adapt to other things. 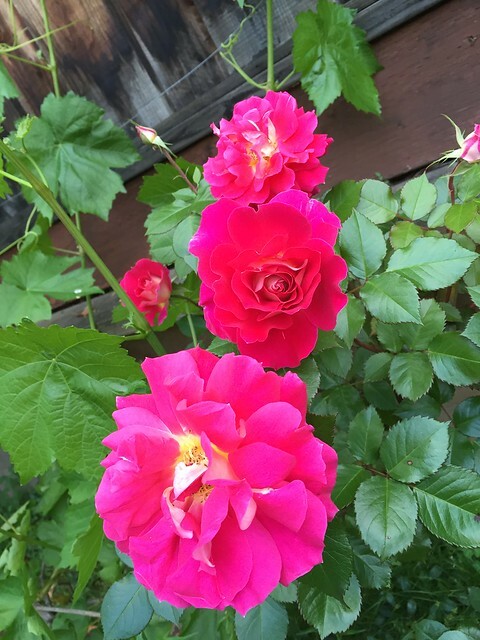 The roses are blooming all over the garden this week, and this is such an old plant which gets a bit scraggly after first bloom, but I don't have the heart to remove it. Because that color! And a white Spanish lavender behind it that appeared next to the purple lavender. My favorite type of plants, the volunteers. Hi all, and thank you for the lovely comments on my teal green silk blouse. 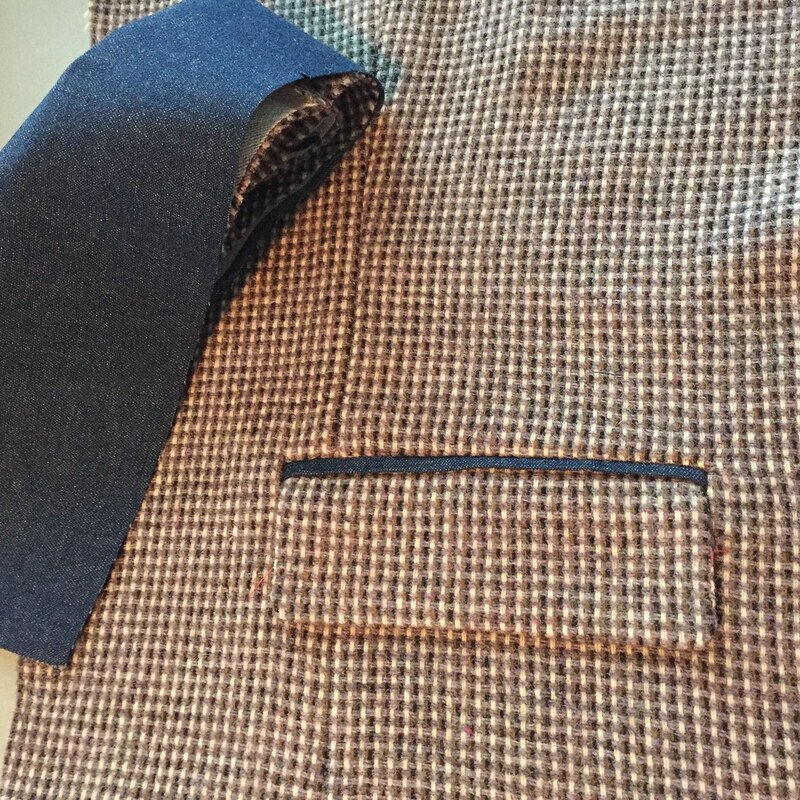 And the feedback on my Craftsy post on how to do the hidden buttonhole placket. Readers seem to appreciate the color-coded how-to. I was a bit worried that it would look odd - however I had a few requests for more of these and now my brain is definitely pondering what else I can detail via the color-coding method. 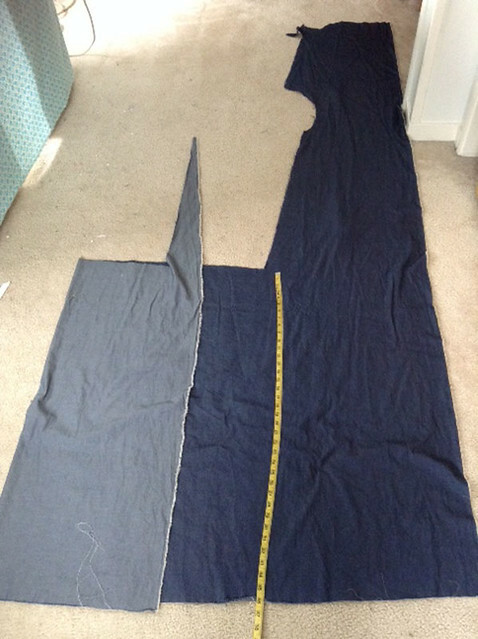 Sometimes sewing can be very confusing - right side, wrong side, flip, turn, insert, trim etc. Certainly sewing calls for some 3-dimensional thinking so anything that clarifies is great in my opinion. This one is super cute - mostly because of the way the stripes are placed. But I don't need another fit and flare dress pattern. But cute, and I always like a pleated skirt over gathered one. Here's another one that I really like, it is so similar to a pattern that I have had for maybe 15+ years? 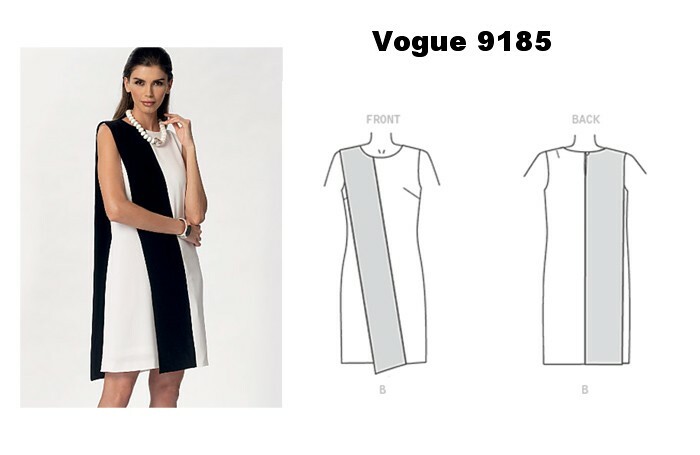 also a Vogue, that I have used to make a zillion shift dresses. But if you are in the market for a new version. I'm not crazy about the neck band but they have a version without. Those cut-in shoulders get me every time, I like that detail. And now for the comedy portion of this post. This dress is bonkers. or maybe someone will sew it up and prove me wrong. But I doubt it! Also there is this pattern, and it's matching corral. Who sews these up? OK don't answer me. As far as the updated BMV website - seems functional and works well - all the search features and groupings make sense and the images are larger. So all in all a good update. Take note Simplicity! That is a mess and I have hardly looked at anything Simplicity since the changes. So difficult to search for a specific category or brand. A mess. The latest video on the BMV site was kind of silly - too much jumping around making it look like a commercial for Target. I really liked to hear Carlos talk about the designs and hope they go back to those. One new McCalls pattern caught my eye right away and I actually bought it today. 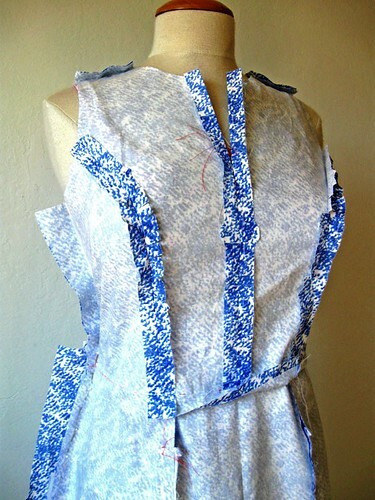 I like that View C with the two fabrics, it just looks like a perfect dress for a 100˚F day here. I might even try the View B - I am attempting to try new shapes and silhouettes, get out of my comfort zone - fashion wise. I have some eyelet fabric that might work for that. In other news, I have been trying my hand at fabric design, which is more difficult that I expected. And I am no artist at all! (also terrible at music but good with languages, interesting how the brain works). Anyway - I saw that my friend Laura Mae is also designing some fabric and I expect her creation will be spectacular. I started with something quite simple and abstract. Here is a sneak peek of what I have sewn, hopefully I will get some pictures this weekend and post soon here. Plus this is a mash up of two Simplicity patterns which worked out really well so details to share on that. Since this fabric I have received two more so I need to get sewing. And then I decided to squeeze in one more wool jacket before the weather hits the 90˚F mark. sneak peek here also, pattern testing for my favorite indie pattern designer for a pattern I think will be out in April sometime. Yes that is wool and denim combined, which hopefully will be a success and not weird. Back to the fabric designing - I have two fabrics which arrived and I need to sew up, which coincides to a new BurdaStyle release of patterns as PDFs. I presume they are in the magazine also but I don't subscribe, instead just have been buying the single patterns as PDFs that strike my interest. This pattern is my obsession of the week. It is so sharp in the stripe version. Although I have doubts about those diagonal backside darts. which could be changed to something else. 99% sure this one will be in my sewing queue by July. And this one is so cute! their example fabric is perfect. As mentioned above I'm trying to sew some new to me shapes, and this straight cut (no waist definition) style is all over now. 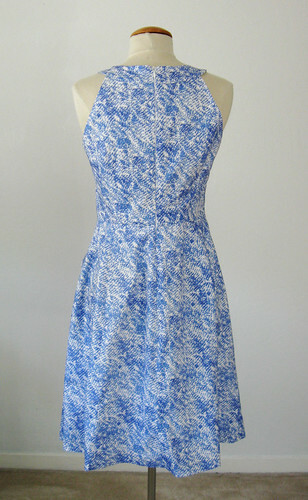 I have a RTW dress in this shape and if the length/fit is right then it is OK on me. Too many dresses!!! That's all for now - kind of light on opinions today (ha, never) OK here's one. 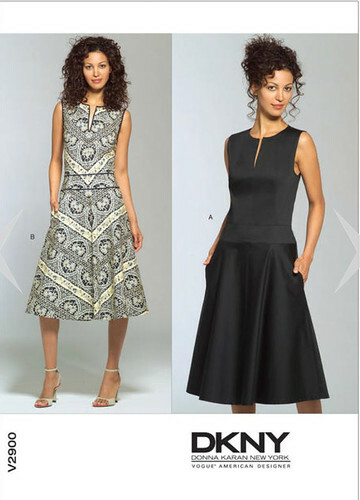 If you are selling sewing patterns then the samples / examples should be impeccable, right? Just a thought. And not a garden photo - instead a pic I took recently in San Francisco, late afternoon and a lovely sunny day. 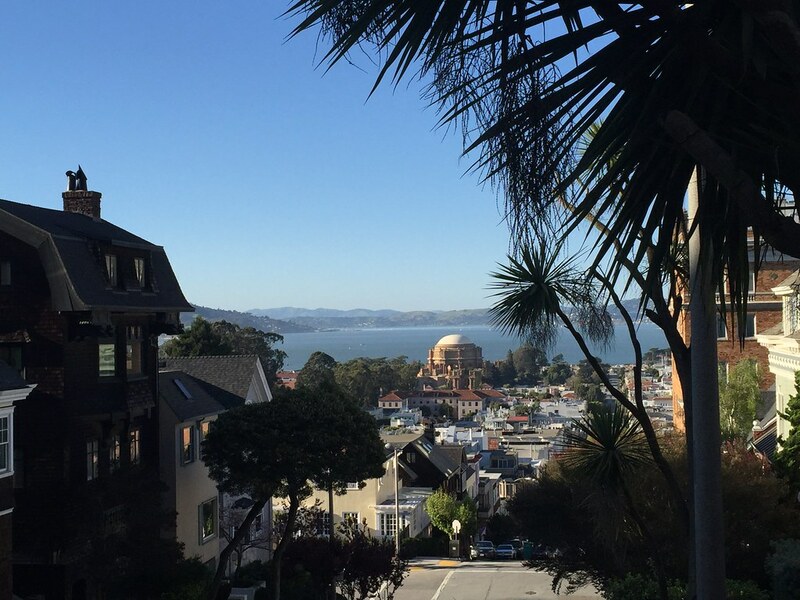 Sometimes in SF you turn a corner and the view is just an amazing surprise. This city is a gem. We won't mention the traffic (which is also epic lately). That domed building is the Palace of Fine Arts, a remnant of the 1915 Panama-Pacific Exposition.